One excellent way to enhance your home’s look is to borrow colors from the surrounding greenery and incorporate them to its exterior. This creates a greater connection between your home and the landscape. At the same time, the resulting blend doesn’t hide your home within the greens and browns. Go for matching colors. Roofs come in different colors. Some of them are easier and safer to work with, like gray and black. To make your roof match seamlessly with the garden or patio, add sidewalks and pavers that create continuity in tone. Gray walkways, for example, pull your stone-colored shingles to ground level, providing a uniform look. If you have a dark-colored roof, make sure the foliage around your home is darker, as well. Then add a bit of contrast with light-colored siding or accent trims. Consider the right texture. 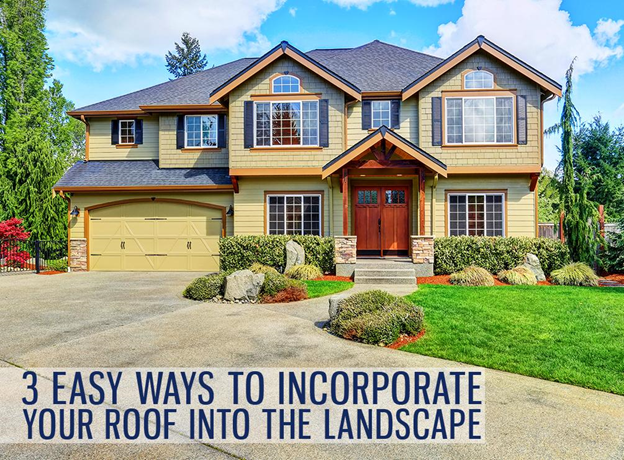 Emphasizing this factor makes connecting your roof to the landscape even easier. Look to your roof’s texture for inspiration. If your roof shingles emulate the look of tile, for instance, make sure that the brick work in your garden matches its texture. They’re two different materials but the shared color and feel keeps both your White Plains roofing and the landscape in sync. Note separate lines and shapes. Some roofing materials have distinctive shape or pattern. You can accentuate this to create a stronger connection. A sloping tiled roof can match against a backdrop of rounded hills. Steep slate roofing, on the other hand, will look excellent on a landscape of craggy mountains. For roofing in Fairfield, CT, that stands out while remaining in tune with its surroundings, turn to Vinylume. As a GAF® Master Elite™ contractor, we offer a variety of roofing shingles that can further enhance the look of your home. These include GAF’s best-selling architectural shingles, Timberline® and Designer. They are available in a variety of thicknesses, colors, and textures that you can use to best effect when creating a strong connection. They can even emulate the premium look and feel of authentic wood shakes or slate, offering more design possibilities. Keep us in mind for your roofing and design needs. Call us at (866) 244-8029 or fill out our form today for a free consultation.